Sai Baba, a personification of spiritual perfection and an epitome of compassion, lived in the little village of Shirdi in the state of Maharashtra (India) for sixty years. Like most of the perfect saints he left no authentic record of his birth and early life before arriving at Shirdi. In fact, in the face of his spiritual brilliance such queries do not have much relevance. He reached Shirdi as a nameless entity. One of the persons who first came in contact with him at Shirdi addressed him spontaneously as ‘Sai’ which means Savior, Master or Saint. ‘Baba’ means father as an expression of reverence. In the Divine play it was designed as such, that He subtly inspired this person to call Him by this name, which was most appropriate for His self-allotted mission. All that we definitely know of Sai Baba is that his arrival at Shirdi was anonymous. He was first noticed in the outskirts of the village Shirdi, seated under a ‘neem’ (margosa) tree, about the year 1854. However, even this date is not definitely noted. Sai Baba of these younger days remained a stranger staying under the neem tree for some time and then suddenly he left Shirdi to come back again sometime in 1858, and stayed on there till he left his gross body in the year 1918. The second advent of Baba at Shirdi, around 1858 was interestingly quite different from the first. This time he accompanied a wedding procession as guest of honor. On the arrival at Shirdi, he was immediately recognized by someone as the same anonymous saintly personality who used to be seated under the neem tree a few years earlier and, greeted Him as “YA SAI” Welcome SAI ! In the early days of his stay at Shirdi he spent his time either wandering in the outskirts of village and neighboring thorny jungles or sitting under the neem tree totally self absorbed. The first set of villagers who regarded this saintly figure were Mhalsapati, Tatya Kote, Bayyaji Bai and few others. Bayyaji Bai felt deeply motivated by this Divine Saint, and with her motherly instinct she used to walk miles on end into the jungles in search of him, carrying food in a basket on her head. Often she found Sai Baba sitting under some tree in deep meditation, calm and motionless. She would boldly approach him, serve the meal and return home. After sometime as though out of compassion for her, Sai Baba ceased wandering and moved into a dilapidated mosque in the outskirts of the village. He referred to this mosque, where He resided till the end, as ‘Dwarkamai’ (Dwarka was the place where Lord Shri Krishna stayed to fulfill His divine Advent). This mosque ‘Dwarkamai’ – abode of Sai Baba became Mother of Mercy for all the time to come. He had a body of athlete built and in his earlier days he was fond of wrestling. Another aspect of Sai Baba’s personality was his love for song and dance. In those early years of his life he used to go to ‘Takia’, the public night shelter for moslem visitors to the village. There in the company of sojourning devotees and fakirs, he used to dance and sing in divine bliss, with small tinkles tied around his ankles. The songs he sang were mostly in Persian or Arabic. Sometimes he sang some popular songs of Kabir. He donned a long shirt – ‘Kafni’ and tied a cloth around his head, and twisted it into a flowing plait like manner behind his left ear. He used a piece of sackcloth for his seat and slept on it with a brick as his pillow. He always declared that Fakiri (Holy poverty) was far superior to worldly richness. He was no ordinary fakir but an ‘Avatar’ (incarnation) of a very high order. But His external appearance was of simple, illiterate, moody, emphatic – at times fiery and abusive and at times full of compassion and love. In the moments of towering rage people with him thought it was ungovernable rage. But his anger never prevented his compassion dealing with the devotees. His anger was evidently directed at unseen forces. He enacted all these simple traits only to hide His real identity as the God incarnate. Under the cover of simplicity He silently worked for the spiritual transformation and liberation of innumerable souls – human beings and animals alike, who were drawn to Him, by an unseen forces. He begged for alms and shared what he got with his devotees and all the creatures around him. He never kept any food in reserve for the next meal. He maintained the ‘Dhuni’ – the perpetual sacred fire and distributed its ash – ‘Udi’ as token of His divine grace to all who came to Him for help. Baba would ask for ‘Dakshina’ (money offered with reverence to the ‘Guru’ or the master) from some of those who came to see him. This was not because he needed their money but for deeper significance, which the devotees realized at, an appropriate time. Baba used to freely distribute all the money that was received in the form of Dakshina to the destitute, poor, sick and needy the very same day. This was one of Baba’s methods for testing out the devotees attachments to worthy things and willingness to surrender. He ploughed up the village common land and raised a flower garden thereon, he watered the plants, carrying pots full of water on his shoulders. In the later years he spent a few hours in this Lendi garden which he himself had laid out in the early days. He was every moment exercising a double consciousness, one actively utilizing the apparent Ego called ‘Sai Baba‘ dealing with other egos in temporal and spiritual affairs, and the other – entirely superceding all egos as the Universal Ego or Over soul. He was the common man’s God. He lived with them, he slept and ate with them. Baba had a keen sense of humour. He shared a ‘chillum’ (clay pipe for smoking) indiscriminately with them to write off the cast superiority and orthodoxy in their minds. He had no pretensions of any kind. He was always very playful in the presence of children. Baba used to feed the fakirs and devotees and even cook for them. Saibaba‘s perfect purity, benevolence, non-attachment, compassion and other virtues evoked deep reverence in the villagers around him. His divinity could not conceal itself for long. Initially when people wanted to worship him formally, Baba protested and dissuaded them. But gradually he allowed it with the prescience that it would become the means for temporal and spiritual benefits to millions of individuals for all time to come. The Dwarkamai of Sai Baba was open to all, irrespective of caste, creed and religion. As the days passed devotees from all walks of life started streaming into Shirdi. The village Shirdi was fast assuming prominence. As the gifts and presentations flowed in, the pomp and grandeur of Sai worship also increased. But Baba’s life of a fakir remained calm, undisturbed, unaltered and there is the Saint’s spiritual glory. He lived His divine mission through His pure self in a human embodiment. The immense energy that was manifest in the body of Sai was moving in a mysterious way, creating and recreating itself every where beyond the comprehension of time and space. 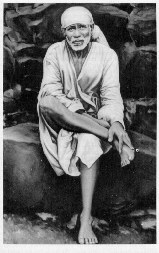 This fountainhead of unsurpassed spiritual glory shed His gross body on 15th October 1918. Every limb, every bone and pore of his body was permeated with divine essence. Baba claimed that though one day his physical body will not exist his remains will communicate with all those who seek him with inner yearnings. His self-allotted labour of love in His physical body was perhaps over. Today He continues to work ever vigorously as the ‘Sai Spirit’.